Our evening cruise (Zodiac boat between Quebec City and Lévis) will thrill you! 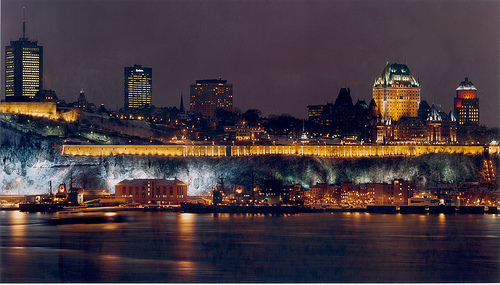 The illumination operations of the National Capital Commission Quebec affect fifteen places and major heritage buildings. Other interventions have been carried out without the involvement of the Commission. The lights installation at the Montmorency Falls Park has been inaugurated on the 24th of May 2008. The desire to draw the attention on the falls and its immediate surroundings at night was the basis of this concept. Truth be told, it was an ingenious way to underline the beauty of the cliffs, the architecture of the Montmorency Manoir as well as its wonderful waterfall. On the 3rd of December 2001, Cape Diamond cliff was illuminated as well. The promontory dominates the Champlain Boulevard in Limoilou’s surroundings in Quebec. At nightfall, the steep cliffs, which have an angle of more than 45 degrees, are illuminated. This natural fortification played a major role in 1620 when Champlain decided to build the St Louis Fort. The illumination of Cape Diamond at night counts around 350 lighting devices. The silhouette of Fairmont hotel Le Château Frontenac is the most photographed site of the Old Quebec. On the night of the 31st of December 1999, this 19th century neo-gothic building was illuminated. The project of giving a nocturnal life to this castle was directed by Fairmont with the collaboration of Quebec City and Canada Parks. The emblematic Saint Michael Church of Sillery, built in 1854, dominates the National Capital at the top of its promontory. As a commemoration of the 150th anniversary of the church, the nocturnal lights project was possible due to the collaboration of Quebec City and the Commission de la Capitale Nationale du Québec. Every night since the 24th of December 2004, lighting devices transfigure the morphology of this site to reveal a grand stork whose beck gently turns towards the firmament. The Commission de la Capitale Nationale du Québec gave a new life, with their lighting devices, to the Notre-Dame-de-la-Garde Church, built in 1877. Notre-Dame-de-la-Garde was venerated as the saint patron of sailors. Situated at 761, Champlain Street around Limoilou, the church stands as an emblem of Quebec’s maritime history. Date of inauguration: December 19, 2000. Built in 1929, under the directives of the two Quebec architects Ross and MacDonald, this building is one of the oldest skyscrapers as well as being the unique representation of “Art Deco” in the city. For more than 30 years, this 17-floor grey stone building, headed with a copper roof, has dominated the view of the Old town with its 80 meters height, having for only rivals the Château Frontenac and the Parliament Hotel Tour.